Nvidia shares are sliding more than 4% Friday after cutting its guidance. “We’re including no contributions from crypto in our outlook,” said Nvidia’s CFO Colette Kress. Wall Street remains bullish on Nvidia despite the less upbeat outlook. Watch Nvidia’s stock price in real-time here. 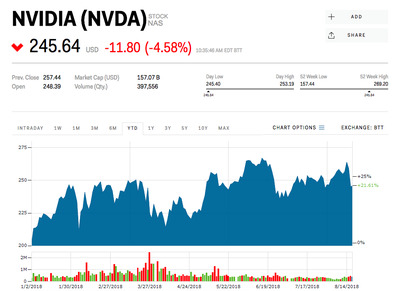 Nvidia shares are down more than 4% Friday on trading after the chip maker cut its third-quarter revenue guidance and warned that it’s crypto business is going to zero. The chip maker slightly topped Wall Street’s expectations on Thursday, but cut its third quarter revenue forecast to $US3.25 billion from $US3.34 billion due to declining sales from its crypto business. “We’re including no contributions from crypto in our outlook,” said Nvidia’s CFO Colette Kress during the earnings call. CEO Jensen Huang added, “Crypto mining market is very different today than it was three years ago,” and admitted that “it doesn’t make much sense” for crypto-specific products to be sold into the mining market. Even so, Wall Street analysts remain bullish on Nvidia. “Even with the weaker outlook, sales are growing 23% y/y, just as the sustainable revenue streams are beating consensus,” William Stein, an analyst at SunTrust said while maintaining his “buy” rating and $US316 price target – more than 22% above where shares settled Thursday. And Oppenheimer agrees. The firm upgraded Nvidia to “outperform” and raised its price target to $US310. “We see significant pent-up demand for Turing and believe estimates have reset for upside as volumes ramp,” Oppenheimer’s analyst Rick Schafer wrote after Thursday’s earnings report. Nvidia shares are up 25% this year.